Three of the greatest football clubs: Celtic, Liverpool and Manchester United. 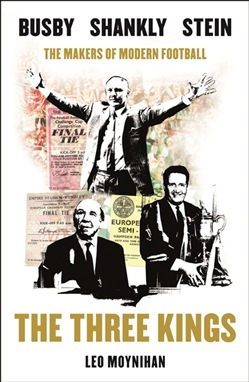 Their three greatest managers: Jock Stein, Bill Shankly and Matt Busby. Three men born within a 20-mile radius of each other in the central lowlands of Scotland; forged in mining communities to subsequently shape the course of modern football. More than the sum of its parts, THREE KINGS, promises a narrative beyond any single biography of its three subjects could. The track record of Jonny Owen and his producers promises a film of critical and commercial importance - loved by all fans of the beautiful game, as well as by fans of the three greatest clubs in the UK. Together these three clubs have a combined 170,000 season-ticket holders, and social-media followings worldwide of over 200,000,000 people. Acquista Three Kings in Epub: dopo aver letto l’ebook Three Kings di Leo Moynihan, Jonny Owen ti invitiamo a lasciarci una Recensione qui sotto: sarà utile agli utenti che non abbiano ancora letto questo libro e che vogliano avere delle opinioni altrui. L’opinione su di un libro è molto soggettiva e per questo leggere eventuali recensioni negative non ci dovrà frenare dall’acquisto, anzi dovrà spingerci ad acquistare il libro in fretta per poter dire la nostra ed eventualmente smentire quanto commentato da altri, contribuendo ad arricchire più possibile i commenti e dare sempre più spunti di confronto al pubblico online.